It’s getting close to the second Falling Down event, which means that I’m upping my keen by catching up on more of the various Tribe 8 materials that have been recommended to me as being reasonably metaplot-free. As previously I should mention that although I am a crew member on Falling Down, I’m not privy to the GMs’ overarching plans or metaplot for the campaign and I don’t know where they intend to go with it, aside from the fact that only the core book and Vimary supplements are held to be canonical and as of event 1 they’ve already deviated from the canon metaplot in a few very public ways. So, if you’re trying to glean hints of what’s coming up from this then you’re going to run into problems. Go frugal with this one; a PDF from DriveThru is available, but obviously not so useful if you want the actual physical screen, whilst physical copies can be obtained for decent prices if you are willing to hunt and be patient. The accompanying Weaver’s Assistant is useful mainly for the collection of Archetypes offered up for use for NPCs or PCs, unless you’re particularly invested in following the metaplot; as well as providing a prewritten adventure which kicks off the first arc of the metaplot and providing an overview of said arc (Children of Prophecy), much of the Weaver’s Assistant consists of giving precise instructions on how each significant faction and location in the core Tribe 8 book should be portrayed. Moreover, if you don’t intend to follow the metaplot, a section which tells you how to portray everything is at best patronising hand-holding, at worst manifestly useless. For me, I find that coming up with my own understanding of setting elements is an automatic and natural process which I don’t really need help for as a referee; if I genuinely don’t have a firm idea of what to make of a setting element, it’s probably because I don’t care enough about it to invest that level of thought in it in the first place. Aside from including a couple of adventures, the Tribe 8 Companion stands out mostly for the way it opens up a range of alternate options for Tribe 8 player characters. Secondly, the book details Quest Circles. These are transparently an attempt to provide a structure for player character parties comprised of members of different Tribes within Tribal society itself, rather than within the Fallen, but it works quite nicely. Circles come into four different types. Harvest Circles are brought together to look into and resolve a particular short-term problem with the authorisation of the Tribal authorities; Horizon Circles are brought together to take a look at more long-term, far-reaching agendas, also with the Tribal authorities’ nod. Moon Circles happen when the Fatimas say “yo, we need some folks to go do a thing”, and naturally since they have Fatimal authority the Tribal bosses are happy to rubber-stamp them. Lastly, we end up with a bit more detail on the Keepers and various factions amongst them (at least one of which comes close to just straight-up putting Alpha Complex in Tribe 8, which is too fun not to at least contemplate), as well as rules and details on running Keepers as PCs. 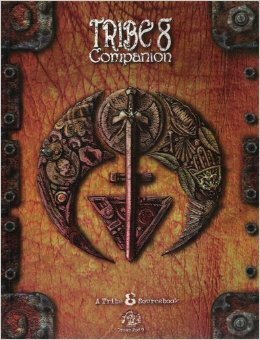 Although the core Tribe 8 rules revolve around the Fallen and present a setting where, at least at first glance, the major force for change is going to come from the Fallen, the Companion does a nice job of enabling alternate takes on the setting – all of which have an interesting different focus. If you want to run a Tribal-based game, Quest Circles are perfect for that – indeed, they’re also handy for a prelude to an ordinary Fallen-focused campaign, since characters could believably all Fall together if they end up being part of a Quest Circle whose Quest goes badly wrong (or a Shadow-Cast Circle that gets rumbled), but at the same time the constraints of acting within the taboos of Tribal society and avoiding Falling provides an interesting challenge, and if your take on the setting has the Fatimas be mostly in the right (or indeed outright objectively in the right if you want to change up canon a bit) then Quest Circles are going to be the perfect focus of play. Likewise, Joshuans, Marians and Keepers all suggest distinct and different modes of play – and each group could believably be the catalyst for the major changes to the setting instead of the Fallen. Although I felt that the Tribe 8 setting doesn’t really stand up if you have full-on Z’bri-aligned PCs, at the same time the Companion illustrates just how flexible the setting is, and just how much scope there is for reinterpreting major parts of it in order to entirely change up its themes and implications. This sourcebook provides rules and setting material to support wilderness exploration adventures beyond Vimary, including some details on the various Squat, Keeper and Z’bri outposts dotted around out there. Readers hoping for major revelations about the status of the wider world, however, may find themselves disappointed: we know there’s big settlements out there like Capal where Quebec City used to be and Hattan down in the vicinity of New York, but if you want your PCs to go down to Hattan and yell “YOU BLEW IT UP” at statues by the seaside you won’t quite get that far on the material here; the Outlands presented here essentially consist of Vimary’s sphere of influence, the narrative to the North, South, East and West cutting off just as you start finding particularly strong communities that could stand as rivals to the Tribals. That said, perhaps the best aspect of the sourcebook is detailing all the different ways the Tribals and Fallen exploit the Outlands. It’s clear that going out there to gather and trade for resources is an absolute necessity for long-term survival – but it’s also clear that here the Fallen have a distinct advantage, in that their Fatimas have already abandoned them whereas to the Tribals passing outside the aegis of their Fatimas is taboo and shameful, something to be feared and fobbed off on those who have disappointed enough to merit punishment but not enough to actually Fall. 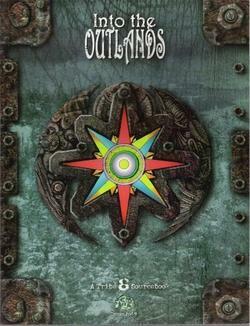 The Outlands are a venue where the Fallen can not only outcompete with the Tribals, but also have a chance to sway crucial components of the Tribal social mechanism to their side. After all, if being sent into the Outlands is a half-way step towards Falling anyway, why not take the last step yourself rather than waiting for someone to decide your expedition didn’t hit quota this year and you’re the one to carry the can? One of the later metaplot-independent rulebooks for the line is also one of its most ambitious. 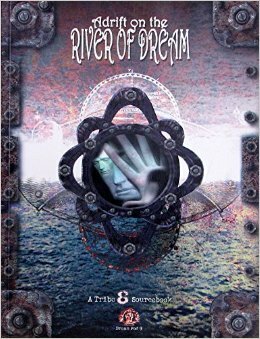 Written to give referees a comprehensive overview of the spiritual metaphysics of the Tribe 8 universe, Adrift On the River of Dream sheds light on the precise nature of the River itself, the Fold between the physical and spiritual world, the terrible consequences of the Fold being sealed and the true nature of Synthesis and Sundering. Some of this information was touched on before in prior Tribe 8 material, but it was never set out as clearly and straightforwardly as it is in the expansive Weaver’s section at the back of the book. If the Tribe 8 line has a whole has a major weakness, in fact, is that it relied an awful lot on game fiction in order to get across ideas – which is fine and dandy if you are a collector who just reads RPG rulebooks and never actually intends to use them to run a game, but is much less useful than a set of clear, uncluttered writeups when you are actually running a game. Thankfully, Bradley Robins and his team avoid that pitfall here, making sure that the Weaver’s section at the back contains a clear recapitulation of all the information that’s hinted at in the game fiction – recognising that the mild redundancy that results is necessary for a book optimised for use in gameplay. On top of that, the game fiction presented here is perhaps the best and most ambitious piece the line has to offer; rather than being a collection of thematically-related chunks of microfiction, it is instead a full-blown Tribe 8 novella, detailing the history of a group of Tribals whose innocent curiosity about the true nature of Synthesis sparks off an investigation which leads them at first to their Fall, then to Hom, and then to the Outlands and cosmic realms beyond. Neatly, useful NPC stats are provided for the members of the cell at each stage of their quest, so the referee can not only decide whether the events of the novel are canonical in their Tribe 8 campaign, but also decide how far events have progressed, and have the player characters encounter the relevant individuals (and perhaps save them from their rather grim destiny) at an appropriate point. With this, I think my Tribe 8 collection is as complete as its going to get. Given that I don’t ever intend to run the metaplot as written, the adventures are likely to be of limited use to me at best. Likewise, I’m disinterested in the Capal setting book because a) it assumes a whole bunch of metaplot stuff has taken place and b) the Vimary book already provides a really top-notch default setting for the game, and the idea of forcibly shifting the PCs away from a setting they are already immersed and invested in to a brand new setting they don’t care about so much seems incredibly silly. (In particular based on what I’ve read of the metaplot the shift in focus is accompanied by setting fire to everything the PCs built in Vimary, and I’ve learned from bitter experience that when you burn down everything the PCs have built the players – not unreasonably – stop feeling like it’s worth building anything). There’s also a set of splatbooks for the Tribes (Word of the Pillars, Word of the Dancers and Word of the Fates), but I tend to be a little sceptical of splatbooks in general and I’m happy with the level of detail I already have on the Tribes. 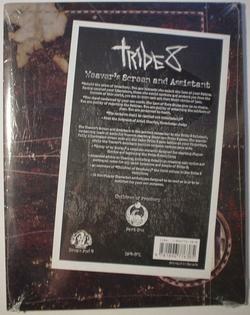 In particular, since most Tribe 8 campaigns are likely to focus on the Fallen, I think it would feel odd to have substantially more detail on a life within the Tribes which the Fallen have left behind compared to the detail we have available on life within the Eighth Tribe itself, but in fact there was never a comparable splatbook put out in the line for the Fallen or the individual Fallen factions. No, between these, the core book, Vimary and Horrors of the Z’bri I reckon I have more than enough to make a Tribe 8 campaign work just fine. Time for another checkup of the ENWorld list of hot RPGs. Usual reminder applies: RPGs are scored on the chart based on what’s being actively discussed on as wide a pool of internet fora and blogs as ENWorld can find RSS feeds for. It isn’t tracking sales, and it isn’t even tracking popularity (because conceivably a game could get onto the chart if there were a sufficiently virulent negative reaction to it). What I present here are the scores assigned to each game, not the percentages (which can tend to obscure whether there’s been a recent explosion of RPG discussion – as there has been for 5E – or whether things are comparatively quiet on the RPG talkosphere). Note that according to the chart page a 0 score doesn’t mean nobody’s mentioned a particular game – a statistically significant sample has shown up but no more than that. For sanity’s sake I’m only tracking zero-scores which previously scored. Games which did not chart presumably either failed to even yield a statistically significant sample or have had their categories retired from the chart (as appears to be the case with the redundant Dnd/Pathfinder category). At least, that’s according to the ENWorld writeup – though since I’ve not seen a game drop off the chart since the Dnd/Pathfinder and Stage categories dropped off, I’m sceptical about that. 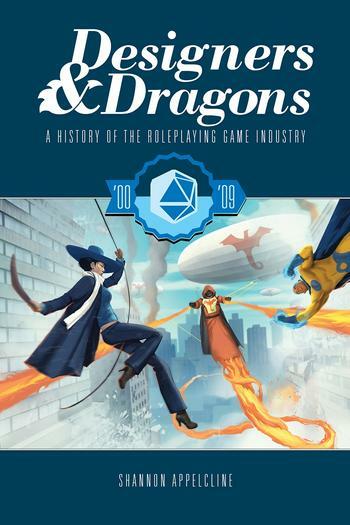 Put out through Evil Hat in a variety of formats (I read the Kindle version), Designers & Dragons is a four-volume update of a history of the RPG industry originally published as a big fat brick by Mongoose Publishing. The end of each section also provides a nice series of pointers on where to go to read up on topics raised in a company’s biography, so (for instance) if you want to trace the career of a particular game designer or follow the publication history of a particular game as they bounce from company to company it’s made easier for you; likewise, if you want to see how mass fan rejection of an RPG’s new edition has affected companies past and present (to pick a subject out of thin air), there’s guidance on that. The 1970s volume is notable mostly for its massive chapter on TSR – perhaps the most expansive writeup any company receives across the entire series. This is frankly justified – as well as being one of the more long-lived companies out there, across its lifetime TSR was consistently the one of the most high-profile, high-turnover, and high-activity companies in the roleplaying industry. and when you’re the biggest beast in the room more or less all your decisions end up having some historical import. Appelcline acknowledges the good work done in Playing At the World in uncovering the origins of TSR and D&D, but the writeup here – whilst not going into quite the same level of depth – makes a suitable companion to that since it extends beyond the point where Playing At the World cuts off and provides the rest of the story of TSR – including the shenanigans between Gary Gygax and the Blumes which ultimately led to the company being taken over by Lorraine Williams. Though Williams’ much-reported disdain for gamers is mentioned, Appelcline does not seem to look into further details as to how that may have affected the creative process at TSR – allegations have swirled around for a while that most of TSR’s products from this point on were only minimally playtested unless the designers could give them a spin at home, because Williams forebade all gaming on company property, and it’d have been good to get confirmation one way or another on that – but otherwise the history presented is both complete enough to include all the major details I am aware of as well as clarifying matters I hadn’t previously been aware of. 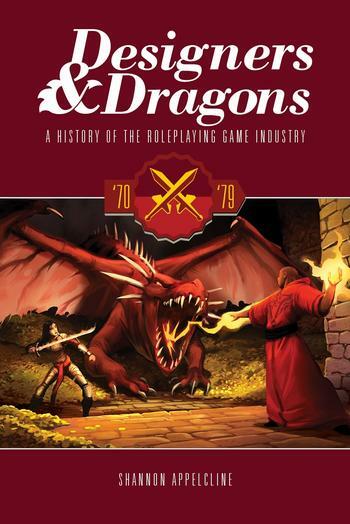 Another notable thing about the 1970s volume is how many of the companies profiled existed mostly to produce supplements for other people’s RPGs rather than to produce their own material – a trend which would quickly reverse in the 1980s, not least due to TSR (holders of the most valuable IP rights in the industry) turning severely against the idea of licensed third party products, only to return in force in the 2000s with the OGL. Beyond this, the thing which struck me the most is just how well Chaosium is doing compared to more or less every other company in here, which have all either either gone defunct, entered hibernation, mostly-to-entirely abandoned the process of writing RPG material, or are slowly re-emerging from a long hiatus, whereas despite their fluctuations in fortunes Chaosium seem to have been consistently putting out RPG products over their entire lifespan – and moreover, making RPGs the heart and foundation of their business, whereas the similarly long-lived Flying Buffalo have had to rely on boardgames and PBM admin to keep afloat and Gamescience have always been more about the dice they produce than any particular RPG material they put out. As far as the 80s volume is concerned, you don’t have any one company originating in this period that manages to become as prominent as TSR was to the 1970s, or as White Wolf and Wizards of the Coast would be to the 1990s, which means that Appelcline is able to give page space to a wide range of smaller publishers. Of these, Lion Rampant is particularly important, since the key players there would go on to be central figures in White Wolf, Atlas Games, Wizards of the Coast and Paizo; even though they aren’t known for much more than their Whimsy Cards gimmick and the early editions of Ars Magica, you could make a legitimate argument that between them the members of Lion Rampant would set the direction of both commercial success and critical acclaim in RPGs for the next 20 years. Another interesting point made -as the cover art implies – concerns how the rise of cyberpunk games in the latter half of the 1980s had a surprisingly disruptive effect on the fortunes of other existing SF RPGs. West End Games’ Star Wars RPG doesn’t seem to have been hurt too badly by them – partly on the strength of the IP, partly because it does a really good job of providing a rules-light swashbuckling-with-SF-flavour RPG system which set it apart from most SF RPGs at the time and if anything rather paved the way for the light approach taken by Cyberpunk 2020. At the same time, however, games such as ICE’s Space Master and GDW’s Traveller seem to have suffered badly from the hit – in particular, Traveller (then on its MegaTraveller incarnation) used to be the “serious” SF RPG of choice, but the cyberpunk games exposing just how increasingly anachronistic and primitive its assumptions about computer technology can’t have helped the game recover from the various other woes that increasingly burdened it. What I find fascinating about this is that Mongoose Publishing’s Cybernetics supplement for their version of Traveller actually provides a really solid basis for a total conversion of Traveller from a starfaring hard-ish SF RPG to a cyberpunk game, and Mongoose Traveller‘s system is not really that far off from MegaTraveller (both being consolidations of and expansions on Classic Traveller); consequently, part of me wonders whether GDW could have saved itself with a similar supplement back in the day, or a powered-by-Traveller complete-in-one-book cyberpunk game to compete with the new upstarts. The 1990s volume is another one where, as in the 1970s, a range of minor histories sit alongside one or two big beasts – in this case, the histories of White Wolf and Wizards of the Coast are the major pillars the book is built around, just as they became the pillars supporting the roof of the industry. The Wizards of the Coast history is particularly fascinating for the way it clearly explains how the terms of the OGL and the D20 trademark licence cultivated a brief boom in the industry that was not only cut short by Wizards’ heavy-handed management of it, but also sowed the seeds of the retro-clone rebellion and the victory of Pathfinder over D&D 4E when the 4E Game System Licence proved so toxic that at least one significant third-party publisher decided that they would rather give up and go out of business than touch the GSL. Appelcline’s coverage of all the different ingredients of 4E‘s abject commercial failure is particularly convincing, creating the image of a perfect storm in which the mass industry rejection of the GSL, the ruinously shambolic rollout of the digital tools that were so essential to the planned 4E experience (including the virtual tabletop platform that was simply never rolled out), the confusing repackaging of the rules via the Essentials line, the failure to stick to any particular planned direction of the line, and the mass exodus to Pathfinder and (to a much lesser extent) OSR games resulted in the 4E line lasting only a fraction of the time any of the previous D&D editions endured. 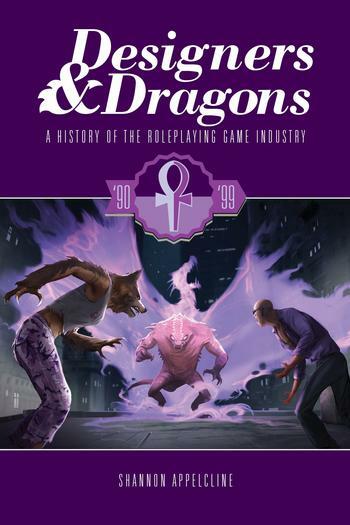 The 2000s volume, catching as it does many of the publishers who popped up during the D20 fad, illustrates this further, as well as providing a decent overview of the indie RPG movement, though as the volume closest to the present it benefits the least from hindsight and the better odds of objectivity that brings. In particular, the section on Evil Hat – publishers of this edition of the book – often describes their products in terms more suited to ad copy than historical commentary, and Appelcline tends to make odd choices when it comes to which controversies in the indie RPG scene to cover. For instance, he goes out of his way to cite a number of articles by John Wick which apparently got inflammatory feedback, and highlights the most provocative interpretations of them to the point where he starts to make Wick sound like an utter troll. Meanwhile, his discussion of Ron Edwards’ career pushes the most understanding and balanced interpretation of Edwards’ articles, whilst entirely failing to mention the whole “brain damage” thing. You can’t have it both ways – either the accounts of people deciding that Wick was an abusive GM based on his own description of his refereeing style need to go, or Ron Edwards declaring half the hobby to be tantamount to child abusers needs to be highlighted. In addition, though there’s a small sidebar on the OSR, there isn’t a single overview of a publisher who began in that movement (as opposed to beginning in the D20 boom and moving over to ) I would have thought that Goblinoid Games, due to their acquisition and revival of a range of old games beyond archaic editions of D&D, would deserve a writeup – particularly since they started out in this era and have recently pulled off the coup of acquiring and republishing most of the games put out by Pacesetter, who got a detailed writeup in the 1980s book, and since Labyrinth Lord is acknowledged by Appelcline as one of the dominant pure retro-clones, but as it is they get only passing mention here and there. Yes, their sales may be slim, but I’d bet they’d outsell many of the storygame publishers Appelcline opts to profile in this volume. This is where a cynic would point out that Appelcline is a co-owner of RPG.net, a website whose community tends to lean more towards indie games and story games and doesn’t have so much time for the OSR. Still, even with objectivity apparently breaking down to some small extent this volume is still crammed with interesting material – in particular, it gives a really good breakdown of the various heirs to the FASA legacy, a tangled family tree which Appelcline does a masterful job of decoding. In focusing on the industry, Appelcline does not quite manage to answer the question of whether the RPG hobby necessarily requires the RPG industry to be in good health – or, indeed, whether there’s a meaningful difference between the two. Certainly, based on the 1970s volume the line between hobbyist fan publications and professional releases was once very thin indeed, and it appears to be thinning out once again as self-publication becomes more and more simple. Moreover, it is questionable whether a publisher-focused model is useful to describe the hobby these days – or, for that matter, the industry itself. Specifically, I would say that the volume on the 2000s begins to betray a weakness in the methodology used here, since the section on Ron Edwards’ Adept Press spends just as much time (if not more) analysing the activities of the Forge forum Ron was so closely associated with it as it does Ron’s own publishing activities. This is absolutely the right focus too, because to understand the development of the indie RPG and storygame scenes it makes far more sense to look to the history of the Forge and story-games forums than it does to look at things on a publisher-by-publisher basis, because it was on fora like the Forge that all of the important cross-fertilisation of ideas between indie publishers were taking place. Likewise, it’s a shame that Appelcline doesn’t have an opportunity to profile any of the significant OSR-focused web forums, because those appear to have played a similar role in driving and inspiring the creation of both retro-clones and new games taking retro systems in new directions. In short, I would say that, whereas in eras like the 1980s and 1990s when high budgets and the occasional vicious lawsuit meant that the RPG hobby was largely at the mercy of the RPG industry, we are now coming into an era when thanks to open design philosophies, Kickstarter, and the role of discussion fora in helping designers thrash out their ideas, the hobby and industry have a much more symbiotic relationship with each other – and if anything, the hobby is in the steering wheel these days to an extent it hasn’t been since the 1970s. In each of the intros to these books, Appelcline wheels out the same (increasingly irritating through repetition) analogy about designers having to fight various dragons in order to keep actively publishing. 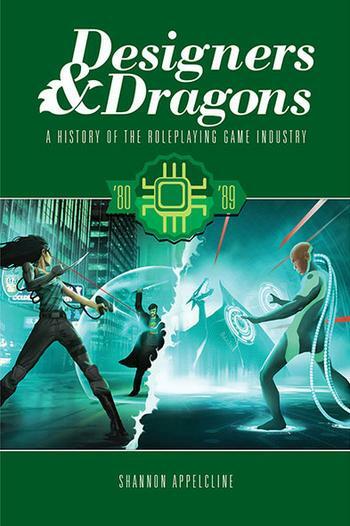 Perhaps the next time the series is revised, the 2010s volume will close with a note on how the biggest dragon designers face these days is the delusion that they have to be part of an “industry” at all – or that there’s scope for an industry catering to any but the biggest-earning RPGs such as D&D and Shadowrun. Perhaps the most seductive dragon is that of hubris, and the belief that just because you like your homebrew design, there must therefore be some kind of market for it. The growth of indie models in which ashcans of games in development are put out to gauge whether there is any appetite for a product whatsoever may perhaps represent the beginning of useful weapons being crafted against this particular wyrm. Still, that Designers & Dragons game me sufficient fodder to come up with thoughts along these lines is an illustration of its strength as a history. Really, my major problem with it is where it happens to end; whilst, naturally, any history needs to have a cutting-off point, at the same time Designers feels doomed to feel dated almost immediately due to the fact of its publication almost immediately before the release of 5th Edition Dungeons & Dragons – as the history shows, the release of any new D&D edition inevitably has major repercussions for the wider industry, and it feels as though Designers will need to enjoy a new edition sooner rather than later to account for what 5E is or is not going to do for the industry as a whole.